Recently, Graylyn was proud to host a Conference perfectly suited to the newly renovated Mews. This event was an educational conference for architects, builders and other construction professionals who specialize in renovating historic properties. The two day event was held in our Mews Conference Room and featured a presentation on the Architectural History of Graylyn. For guests who work daily to incorporate modern efficiencies into historic properties Graylyn was an ideal case study. The host of this event, Pete Miller, was kind enough to share his thoughts on the Mews and we are happy to share them with you. What did you think of the renovations done to the Mews? The renovations were expertly done in a fashion that preserved the historical foundations of the building while also providing the technological requirements of modern conferences. Did you find the space to be a good fit for your meeting? For our group of 100 attendees, 10 sponsor booths and a food table the area felt intimate but not overcrowded. Is there anything that you would change if you could? Parking was a bit confusing and tight- better signs might help people more easily get to the right place. What are some of the architectural aspects of the space that you noticed/enjoyed? The roof tiles on the Mews were a major hit, unique and beautiful. The details of the courtyard, the pattern of the cobblestones, the enclosed space, etc also impressed our attendees. Would you be likely to use the Mews again for your group? Already planning on it, our venue director could say enough nice things about how helpful the staff was. Was there anything about the space that stood out to you? The courtyard was an amazing venue to relax in (weather permitting), overall the area was conducive to a very relaxing experience. The rooms were phenomenal. Did you find the color palette and lighting to be environmentally pleasing? Yes, one detail that stood out was the conference room’s lighting, it was easy to see the screen even without having to completely black out the space and allow some natural light in. This is a big deal for those of us who have to sit all day in dark rooms staring at a screen. Whenever I stay in a place like Graylyn I often think of a swan. What other image so perfectly embodies grace, beauty and luxury than the majestic bird gliding across a body of water? What is not known to most is that underneath the surface of that water swans have to paddle furiously. The analogy will make sense to anyone in hospitality: guests must experience serenity and comfort, but an intense effort is required to make that experience possible. 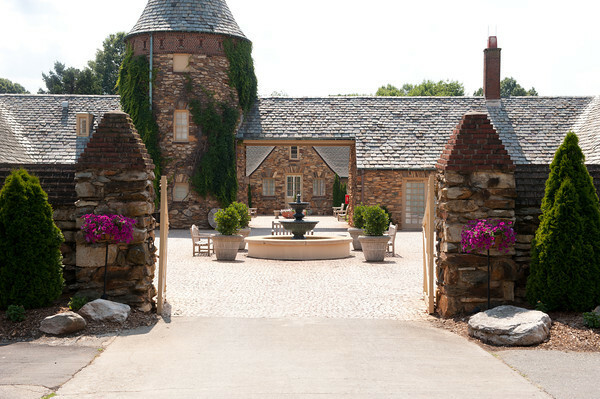 Another major element in the Graylyn experience is the estate itself. The Mews is, in a word, remarkable. The manor house where we had dinner was no less extraordinary. From thick stone roof tiles to the intricately decorated rooms every aspect of Graylyn evokes the history and quality in great traditional building. The Traditional Building Conference Series could not have hoped for a better venue to showcase in practice what we discuss in our seminars. Graylyn handles the delicate balance of effort and atmosphere expertly; thanks in large part to their hard working and accommodating staff. Our registration manager, Carolyn Walsh, was particularly impressed by their “can do” attitude and quick response times. Kellen in particular never wavered in her attentive, upbeat attitude- we had no doubt that when she said, “I’ll take care of it” it was indeed taken care of. Larry, our guest service representative also deserves recognition as an outstanding example of professionalism, friendliness and capability. Crisp Cartier manos azules de replicas relojes la hora y de los minutos. Las manos de día y fecha son del mismo color azul. Me gusta el día único de posicionamiento a las 6 en punto, da todo el dial de un aspecto diferente. No hay mano de segundos aquí, pero el movimiento es automático japonés automático de manera que la mano de los segundos habría estado barriendo como el original de todos modos. Me gusta replicas rolex el Cartier reloj réplica caso que es cepillado en los lados y pulido en la parte superior. Parece tan real. La correa de cuero negra es sólida y buena calidad también así que es toda buena allí también. Es de replicas breitling cuero en el interior también y tiene los grabados de Cartier. Es una reproducción divertida y sólida de Cartier para llevar. Peso es bueno y porque mi amigo es uno de replicas omega los más elegante siempre vestir-up tipo de chico que le queda bien. Es todavía más de una ocasión AAA réplica reloj Cartier para él también y estos bebés, a pesar de que en el lado más barato, comienzan en más de $ 5k por lo que asegúrese de conocer el valor de su reloj original antes de ir para él.